FILE - Gambian President-elect Adama Barrow is shown during an interview in Banjul, Gambia, Dec. 12, 2016. Barrow flew to Senegal, a day after West African leaders failed to persuade President Yahya Jammeh to step aside. Gambian president-elect Adama Barrow spokesman confirmed Sunday the upcoming inauguration will take place on January 19, despite President Yahya Jammeh’s refusal to step down from office. "Jammeh's term shall end on the 19th and the same date president-elect Barrow's term begins. Nothing will change that. He will be sworn in and shall assume office on that date without fail," spokesman Mai Fatty told AFP. Barrow flew into Senegal after West African regional bloc ECOWAS failed to persuade Jammeh to hand over power when his current five-year term of office ends during the coming week. “Barrow is in Dakar as of Sunday, just after midnight,” according to APS agency. It was not immediately clear why the president-elect traveled to Senegal, but sources said he felt vulnerable given a lack of security. “The Senegalese president accepted the request [to host Barrow until inauguration] of his Liberian counterpart Ellen Johnson Sirleaf, the current ECOWAS president,” it added. 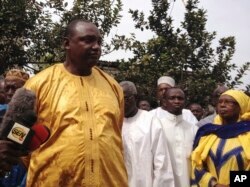 Barrow met Saturday in Mali with world leaders during the annual France-Africa summit in Bamako. The presidents of France and Mali, Ibrahim Boubacar Keita and Francois Hollande, both called on Jammeh to step down when his current five-year term of office ends. FILE - Gambia President-elect Adama Barrow, left, speaks to members of the media in Banjul, Gambia, Saturday, Dec. 10, 2016. Barrow was officially declared the winner of last month's election by a slim margin. Jammeh, who has been power in Gambia since a coup in 1994, originally accepted defeat, but later reversed himself and filed suit to challenge the results, citing voting irregularities. Edward Gomez, a lawyer for Jammeh’s Alliance for Patriotic Reorientation and Construction, filed a legal complaint against the electoral commission about a week after the election. “The inauguration of the president elect should be held when Jammeh’s term officially ends. The court does not have any mandate to put an inauguration on hold,” Aziz Bensouda, secretary general of the Gambia Bar Association, told Reuters. Bensouda added that an injunction would be unconstitutional. Under Jammeh, the Gambian government has been accused of numerous human rights abuses, including arbitrary arrests, torture and forced disappearances. FILE - Gambia's President Yahya Jammeh attends the plenary session of the Africa-South America Summit on Margarita Island, Sept. 27, 2009. Jammeh indicated that he will attempt to wait until the Supreme Court ruling is handed down before he accepts the election results. The African Union Peace and Security Council also released a statement saying it will cease to recognize Jammeh as a legitimate president after Jan. 19. In addition, the council cited "serious consequences in the event that his action causes any crisis that could lead to political disorder, humanitarian and human rights disaster, including loss of innocent lives and destruction of properties." 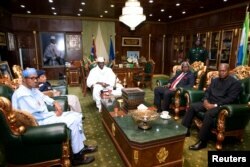 If Jammeh refuses to relinquish power, it will put him on a path to confrontation with Barrow and ECOWAS, which has placed its military force on standby if Jammeh does not step down as scheduled. 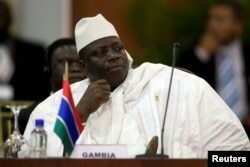 Jammeh, however, has warned the international community not to get involved.